Harris Teeter is helping Mountaire Farms Wage War on Hunger during a one-day food drive Saturday, March 10, 2012 at your Delaware Harris Teeter stores. 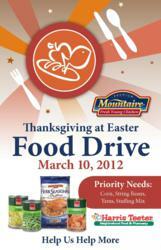 The food collected during the food drive will benefit the Mountaire Farms Thanksgiving at Easter campaign, the goal of which is to feed over 10,000 area residents in need this Easter Holiday. Harris Teeter, a strong advocate for hunger relief, has partnered with Mountaire Farms for many years, participating in its Thanksgiving for Thousands program providing balanced holiday meals to those less fortunate households located throughout the Delmarva Peninsula. The company also hosts a campaign during the month of November called Harvest Feast to raise both awareness and funds for the fight against hunger. Priority needs include staple food items such as 16 oz. cans of corn, string beans, yams and stuffing mix, and this Easter, Mountaire Farms hopes to feed over 10,000 people a nutritious meal. Meal boxes include a plump Mountaire Roaster, (2) 16 oz. cans of corn and string beans, (1) can each of yams, baked beans, gravy and cranberry sauce, plus a box of stuffing mix . The meal boxes will be packed with the help of American Legion Volunteers and distributed to area food pantries and soup kitchens who provide them to local families in need. Harris Teeter Inc. with headquarters in Matthews, N.C., is a subsidiary of Ruddick Corporation (NYSE:RDK), a Fortune 500 company. Harris Teeter is the 24th largest supermarket in the U.S. with 2011 sales of $4.29 billion. The grocery store chain employs over 24,000 associates and has 206 stores in North and South Carolina, Virginia, Georgia, Tennessee, Maryland, Delaware, Florida and the District of Columbia.